If you've kept up with my blog, you know that i have the world's most unruly hair. Ok so perhaps I'm being a bit dramatic, but my hair is seriously a diva! I've never had the pleasure of just waking up and looking cute, nope... not me! In order for my hair to look even remotely presentable, you better believe that there is a whole lot that goes into it. As a beauty blogger, testing out new hair products is a fun part of the job. However, many of the products i test never actually make it on to the blog because sadly, they weren't a good fit for my hair. Yet, when a product does work, i feel the urgent need to share it with all of you! 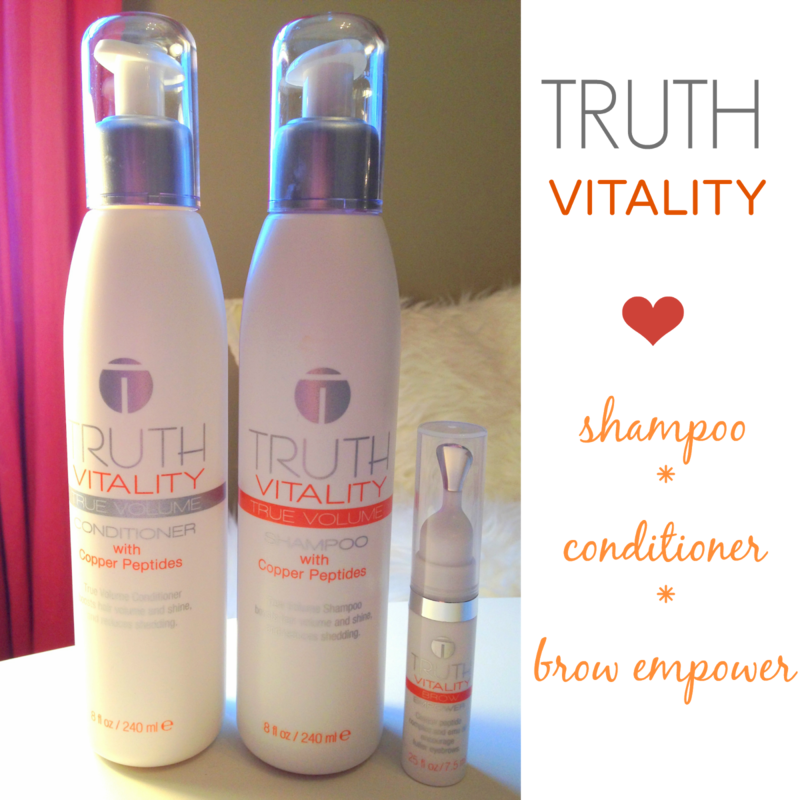 Introducing, Truth Vitality... a hair care line that is dedicated to promoting healthy, voluminous (hey fellow jersey girls myself included) and tangle free hair. These products are formulated with copper peptides and emu oil for healthier hair growth, improved fullness and decreased shedding. Hair is smoother, shinier with fewer tangles and youthful strength. One of the things i struggle with, and i know I'm not alone here, is shedding! Goodness! If i so much as dare run my fingers through my hair, i get clumps and clumps of fall out! This is no OK! I have actually noticed a decrease in this since using Truth Vitality shampoo and conditioner! My hair feels soft, shiny and most importantly easy to manage. My only concern with the shampoo and conditioner is the pump. The shampoo pump dispenses very little product and i found myself pumping a whole lot to get enough to cover my entire head. Also, sadly... and it could have just been my bottle, the conditioner pump didn't work at all. I think this is a wonderful product and hope that with a little packaging redesign, this little issue will be taken care of. The other Truth Vitality product I'm especially excited about is the Brow Empower. I don't know where i went wrong, but my brows are barely there anymore. I don't over pluck.. in fact, i barely pluck... so where did they go? I have high hopes that this beauty will help me out here. I will keep you posted as this will take a little longer to test out. Just knowing that there is something out there to tackle this issue makes me happy! I'm also happy to report that these products are sulfate, silicone and paraben free. Oh and no worries, they are not tested on animals either... we can all breathe a sigh of relief now!